With your generous gift of any amount, we’ll send you the special 2-CD Miracles Are for You series, Where Miracles Begin booklet, and bonus 2019 Hope Around the World wall calendar. Catch the revelation that miracles are for you in this special 2-CD teaching series. You’ll also receive the Where Miracles Begin booklet, which will show you how the choices you make can usher in the miraculous! Plus enjoy a bonus gift — our 2019 wall calendar, designed to encourage and inspire you throughout all of 2019! 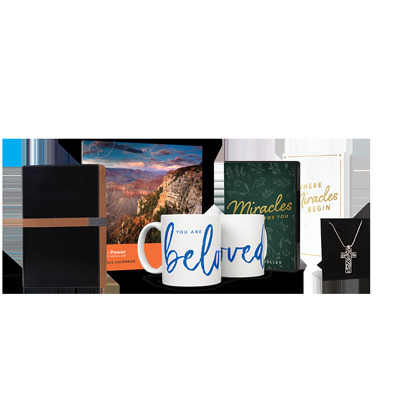 With your gift of $100 or more, we’ll send you 2 Beloved mugs, the God Loves You and So Do I necklace, the 2019 wall calendar and the Miracles Collection. Enjoy sipping coffee or tea from our Beloved mugs and be reminded that you are the beloved of Christ. The God Loves You and So Do I necklace will be a beautiful addition to any outfit or a meaningful gift to a loved one. With your gift of $1,000 or more, we’ll send you the special Four-Translation Comparative Bible and other resources. Sow into the Word of God and grow in your faith. With this special Bible, you can read Scripture in the NIV, KJV, NASB, and Amplified versions side by side, allowing you to go even deeper in your study of God’s Word.